Since his return to Israel in 2012 from a seven year journey to California and Buenos Aires, Ari is residing and creating his artwork in Mitzpe Ramon. Ari is deeply immersed in the field of recycling partially as a result of living in California, which is a leading state in promoting awareness of refurbishing materials both in practice and legislation. 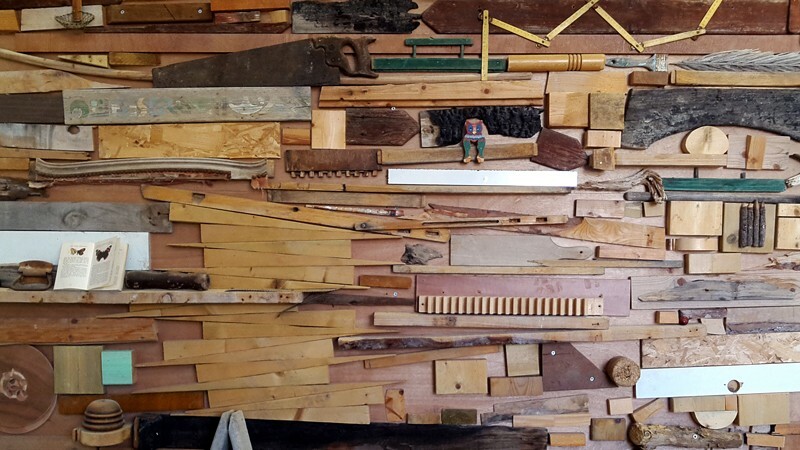 There is so much wood out there to be salvaged that as a conscious artist he cannot just ignore it. Having lived many years in different countries and being exposed to an array of cultures, he now claims he has reverted to the millennia of hunters/gatherers as he embraces anything he can put his hands on: broken furniture parts, used pallets, old books, metal parts, stones and roots, to name a few. He is more forgiving. The flaws are in the DNA of a salvaged piece of wood or a rusty metal and thus he readily adopts the philosophy of making an effect from a defect. Within this scope of imperfection lies the challenge of the work since it is an unfolding cognitive process, an intellectual exercise and not a series of mechanical steps to follow. It is an attempt to give a new life to a neglected object or material. Reincarnation if you wish. Ari Shomron holds a continuous exhibition of his works in a new gallery named Azul, meaning Blue in Spanish. 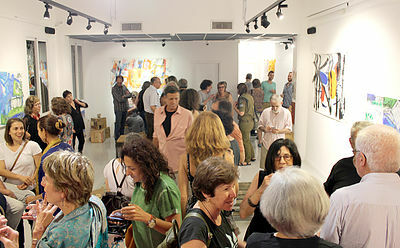 The gallery is located in Florentin neighborhood in south Tel Aviv within a textile-printing company, the first of its kind in Israel established in 1951. The gallery is also an ongoing showcase for guest artists who exhibit their works throughout the year and hold artist talks and lectures. In addition Azul offers its premises for special events of up to 60 people which include poetry reading, book inaugurations, intimate jazz concerts, Fringe Theater, lectures, seminars, etc. Contact details of Azul Gallery can be found below. How are Pelsid Labels Ltd. and the Azul Gallery connected? In 1951 Mr. Zvi Pejsakievitz arrived in New York City with a mission to find an exciting idea to start a new business in Israel. He walked the streets of Lower Manhattan, mainly in the textile area when suddenly a fierce rainstorm forced him to find immediate shelter. He found himself at an entrance of an industrial building. The noise of working machinery and his natural sense of curiosity led Mr. Pejaskiewitz to enter the compounds of what was a label printing factory. A short meeting with the owners convinced him that this would be his new endeavor. He purchased from a French manufacturer his first manual machine which is on display at the entrance of the factory/gallery and began his business in his kitchen balcony. A few months later a factory came to life in the Beit Romano building in south Tel Aviv – the first Israeli label printing company. In its glory years the factory employed 25 workers and printed and exported labels to Victoria’s Secret, Marks & Spencer, GAP, Calvin Klein and many other leading brands of the fashion world. In the 90’s the factory moved to its current location in the Florentin neighborhood and continues to provide service to its local customers for 65 years. Ayala Azulay is currently the owner of Pelsid Labels and in 2015 the factory allocated space to form the Azul Gallery which is jointly owned by Ayala and Ari.